Siri, one of the incredible features offered on newer iPhones, acts like your own personal assistant who can help with many different tasks. In order for Siri to help you do all the wonderful things she is capable of, you need to be able to communicate with her. Here’s how you can talk to Siri. Press and hold the Home button, the center button on the earphones, or the button on your Bluetooth headset, until you hear the beep and the Siri screen opens. You can do this from the Home screen or from within an app. Siri knows what you’re doing and responds appropriately. Or, if you turned Raise to Speak On, press the Home button or the Sleep/Wake button to wake your iPhone and then bring your iPhone to your ear. After you hear two rapid beeps, ask a question or make a request. 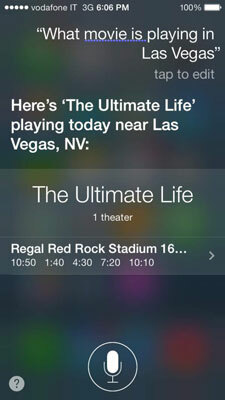 Siri uses the apps on your iPhone. You don’t have to open the app — you just give directions to Siri. 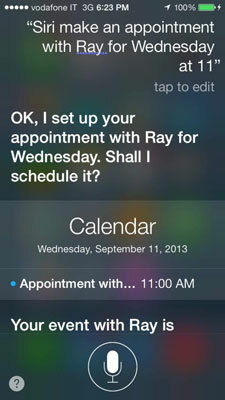 Say, for example, that you’ve told Siri to set up an appointment with Ray at 11 a.m. on the following Wednesday. Mosey on over to your Calendar and you’d see the appointment. Efficient, hm? If Siri doesn’t understand what you say, then make corrections. Type corrections in the bubble onscreen that shows what Siri understood or tap the microphone and dictate the correction. Tap Done when you finish. If a word is underlined in blue, tap the word and then choose an alternative from the choices, or tap the microphone to dictate the correction. Tap the microphone to speak to Siri and clarify your request. To correct a message or e-mail before sending, dictate the changes or say “Send it” when it’s correct. Correct Siri if Siri mispronounces a name when reading messages or relaying voicemail. Just say, “That’s not how you pronounce name.” Siri then gives three options, and you can choose the correct one. To cancel a request, say “Cancel,” tap the microphone button, or press the Home button. In Settings→General→Passcode Lock, you can allow access to Siri even when your iPhone is locked. Doing this, however, compromises some of the Passcode Lock’s security features.